The view from a roof is intimate and distant. You're surrounded by people--at least the suggestion of people, the promise that they're going on about their lives in the shadows of windows below. But you're removed, above it all, caught in the light that glances off of slanting roofs and walls and eaves. Ten Artspan artists explore the view from the roof. 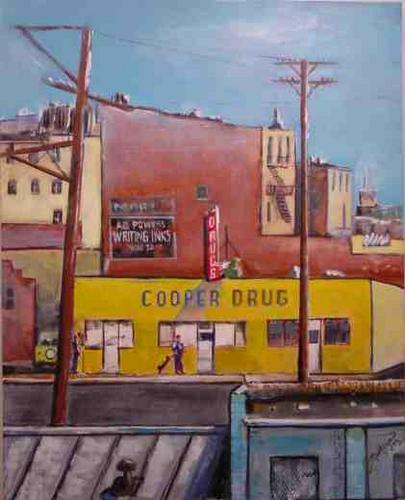 Jon Montoya's painting Cooper Drugs: Curtis Apt Window View captures the view outside my window, years ago, on 20th and Curtis Street in lower Denver. "It was a view with captured the haunting feeling of the past with its small brick buildings and beaten-down signs. Cooper Drugs is still operating and is one of the few places you can pick up a six-pack and bottle of Iodine at the same time." 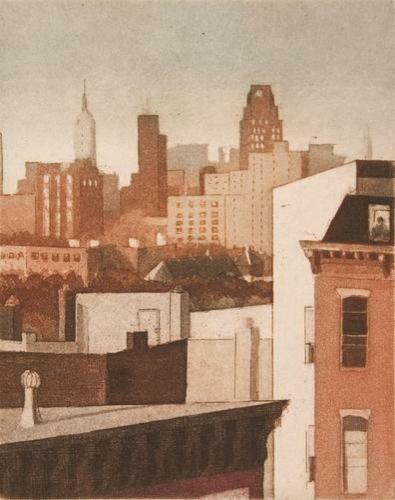 Linda Adato's Roof to Roof is part of a series of etchings and monotypes that depict diverse architectural themes: ancient ruins, New York City buildings, bridges and her own backyard. "I enjoy exploring the geometry of the structures in these images and capturing the light at a certain moment or time of day." Moshgan Rezania uses oil paints because their rich impasto allows her to create the intensity she wants. 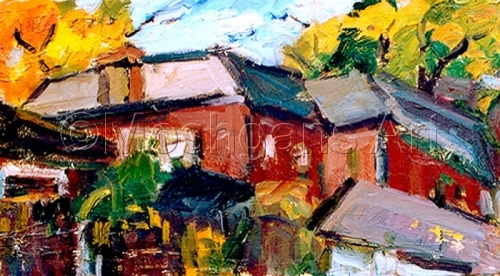 She captures the liveliness and motion of a series of Roofs & Autumn with bold brush strokes and vivid color. Kelly Milukas says "My subject matter is broad and diverse, influenced by an interest for common place motifs found in everyday life…Capturing the light, texture, and repetition of pattern in form, is the foundation of my art." 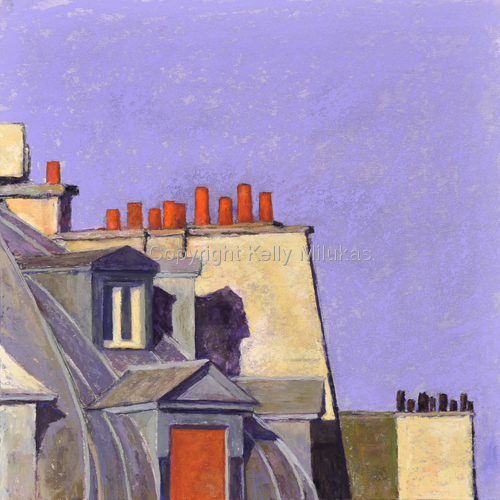 In Paris Tops she finds bright beauty in the rooftops of Paris. 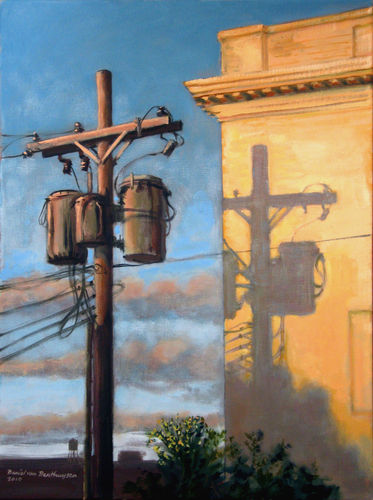 In Carol Tippit Woolworth's paintings, she attempts "to capture an intense moment that rings absolutely true. A scene, a certain light, colors arranged that pierce through one's center to extract an emotion. A search for beauty in the familiar, unseen until revealed by the work. The mundane elevated to art." In Avingnon, Autumn, the rooftops spread out below us like a mosaic. In September Sunset, Daniel Van Benthuysen captures the light of a certain time of day and time of year, as it glances against a slice of building and a rooftop. 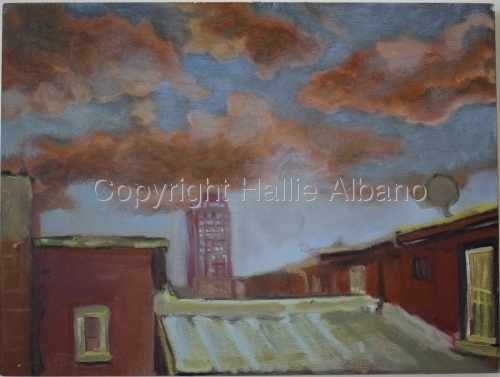 Hallie Albano's moody painting Philadelphia Roof Top captures "the inner feelings triggered by a certain permanence or grouping of colors...An automatic reaction of memories, senses and energy are being reflected then transferred into the viewer's soul." Paul Steiner says, “Sitting on the edge of a cliff in the backcountry, with the sun burning and the wind blowing, and the potsherds and ruins of past inhabitants never far away, enforces a sense of perspective on our own self-importance…I like the roughness of the world I live in to be reflected in the roughness of the paint. And I always want to make clear that it is paint. 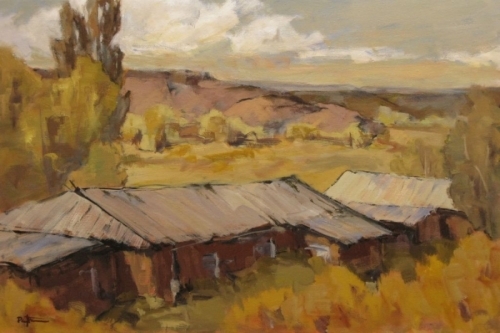 The trees and canyons and the people who live among them are made of wood and rock and flesh, but my paintings are not; nor are they replicas or photographs.” The roofs of Diana's Place echoes the hills beyond. 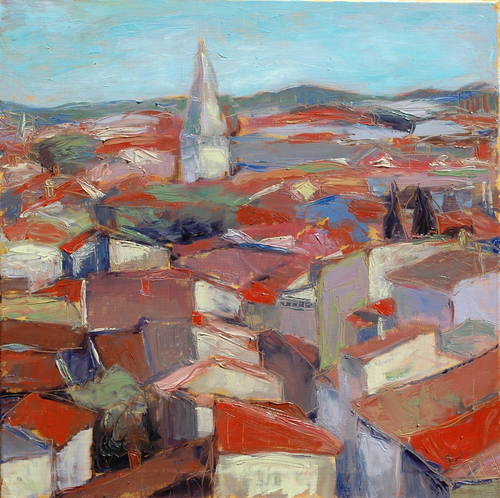 Virginia Cooper has a fascination with the daily lives of people. 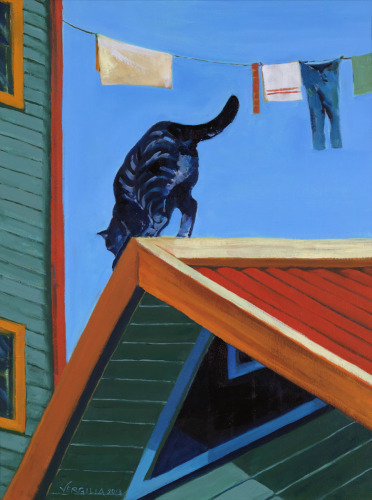 In Caliente, she captures a moment in the life of a cat in the La Boca region of Buenos Aires, Argentina, as it perches on the edge of a roof. 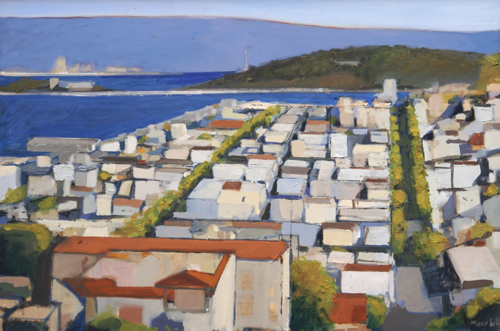 Geoffrey Meredith's cityscapes, including Art Institute Looking East, are painted in a style he calls NorCal Representational Abstraction. Most start being quite representational, but then each painting takes on a life of its own. "What I try to do in my paintings is to capture the essence of what is depicted, a distillation that I also strive to make pleasing to the eye in terms of form and color and texture. The paintings are thus 'abstractions,' but are also referential - almost always grounded in life, mostly in nature."